Errol: Hi! Wow, you guys are awesome. Thanks so much for sharing how you learned about NaNoToons! It’s interesting, you know, doing things and I never really know how many people read my comics. Sure I have stats, and whatnot, but I don’t check things that much. I heard about NaNoToons because of Debbie Ohi, the original artist. She asked me to help her and I jumped on the chance to collaborate with her. I really enjoy NaNoToons and this little crew that we have here. I’m going to talk a little bit about last night because a long time ago, I used to be involved in Brickfilming, where you do stop motion animation with LEGO. There was a small community there and just like any internet community, one got involved and got to know a lot of people. They kickstarted a documentary and they asked me for an interview. I was shocked, and honoured, because I haven’t been in the community for a number of years now. However, it reminded me how much I’ve enjoyed the little online forums and bonds I have made on the internet for the last decade or so. Ahem, sorry, I get sentimental when I think about the past. Let’s get back to writing! This entry was posted in 2014 and tagged bea, jen, rob. Bookmark the permalink. That is so cool! I’m glad you got the chance to be interviewed and kind of got a blast from the past. Online communities are the best! I can’t fully relate to this–partly because I don’t drink very much caffeine usually, so I can fall asleep when I need to, but partly because caffeine doesn’t do this to me. I still get tired, but just can’t sleep. It’s the opposite of helpful. I have been just generally hyper since NaNo started, though, so it’s sort of like this. Oh, and when I do word wars, which I’ve done this year for the first time, I type like that, just because of adrenaline. 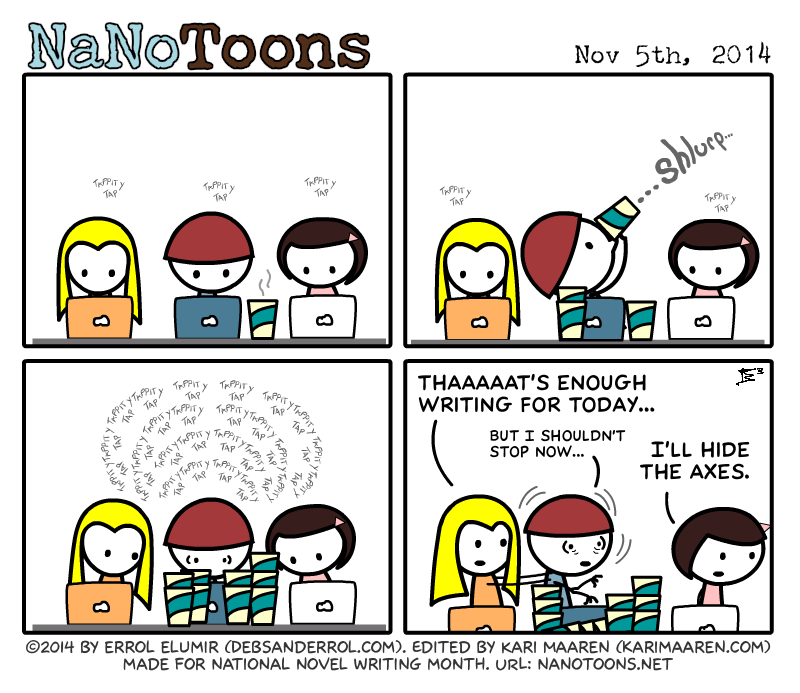 Great toon for NaNo! It’s so nice when my writing makes that tap-tap-tapping and things are moving smoothly. Also, congrats on the interview!